NVIDIA is going to launch their GeForce GTX 960 graphics card based on the GM206 GPU architecture in the next few weeks but leaks regarding the retail cards and specifications are already hitting the web. We recently posted an article on KFA2’s impressive EXOC and reference graphics cards however we had to remove it since it contained NDA material. But that’s not the end of leaks to comes since our buddies over at Videocardz have been able to spot two cards from manufacturers Gigabyte and Inno3D. Before we start off with the cards, we would like to share with you the information which was previously leaked a few days ago. The GM206-300 GPU on the GeForce GTX 960 has a much smaller die size compared to the GM204 core which shows that the graphics processing clusters have been arranged to focus entirely on efficiency by scrapping out needless components. A good guess would be that the clusters could be comprised a total of 8 to 10 SMMs, that would make a CUDA core count of 1024 cores and the ROP/TMU count of 32/64 depending on the core configuration since it remains to be seen whether the GM206-300 will be the fully enabled GM206 or whether NVIDIA will leave room for more price effective offerings and better performance variants such as the alleged GeForce GTX 960 Ti and GeForce GTX 950 graphics cards. So let’s end the speculation here since we know that we are going to hear them in a few days anyways and look at the new custom models. 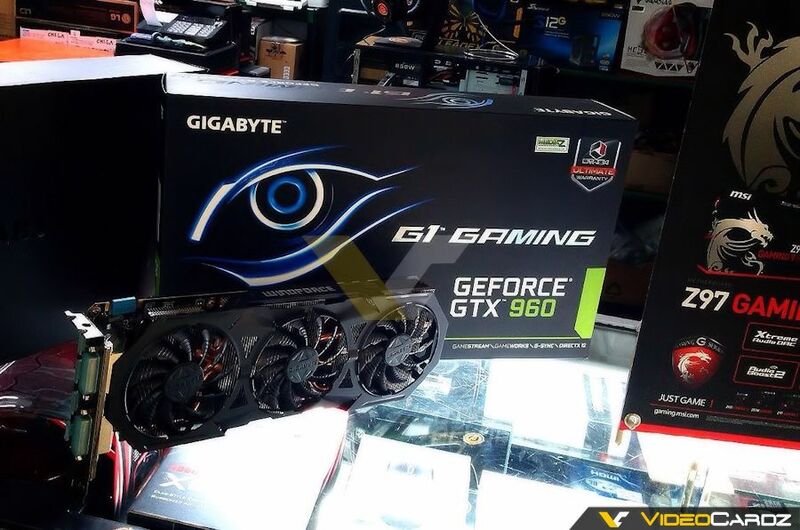 Videocardz has spotted the first GeForce GTX 960 G1 Gaming graphics card from Gigabyte which comes with a high performance custom design. While the GeForce GTX 960 is a very power efficient graphics card and will be featuring a TDP of around 100W that is likely to keep temperatures cool, the G1 Gaming comes with the Wind Force 3X cooling design which adopts a triple fan design pushing air towards a dense aluminum fin heatsink that is fitted with several heatpipes running throughout the fins. The card comes with single SLI connector, display outputs include Dual-DVI, HDMI and three display ports. It is unknown ehether the card will ship with a single 6-Pin connector or an 8-Pin connector but from the custom PCB design, it seems the latter is more possible. Inno3D has two GeForce GTX 960 graphics cards in the pipeline. The first is the highly custom designed iChill GeForce GTX 960 Ultra which features the same HerculeZ cooler we saw on the GeForce GTX 980 and GeForce GTX 970 graphics cards. The difference here is that while the other cards used the HerculeZ X4 Air Boss variant, the GeForce GTX 960 will be using the HerculeZ X3 variant since the card on the side of the cooler shroud is missing and being such a power efficient graphics card, it won’t ever get any benefit from an extra fan on the side of the PCB. The card has a clock speed of 1178 MHz while the memory is clocked at 7010 MHz effective churning out 112 GB/s bandwidth on a 2 GB VRAM buffer. The display connectivity includes DVI, HDMI and three display ports. The card will require a single 8-Pin power connector to boot the card. The second card from Inno3D is a much smaller HerculeZ X2 variant which will make use of the same core clock speeds of 1178 MHz and 7010 MHz effective memory clock. It seems like the only difference between the two siblings is the visual appearance since the OC is pretty close to the reference model while making use of a more optimized HerculeZ variant which reduces the overall price of the board. The HerculeZ X2 comes with adequate cooling while the card features a single 6-Pin connector for power and has a single SLI goldfinger indicating 2-Way SLI support. The display outputs on the GeForce GTX 960 OC include DVI, HDMI and three display ports.